Welcome back loves! I'm so glad you've decided to accompany me in this Curl Care 101 endeavor. Just in case you missed it last Thursday, click here to learn about deciphering your true texture. This week, it's all about regimen building. 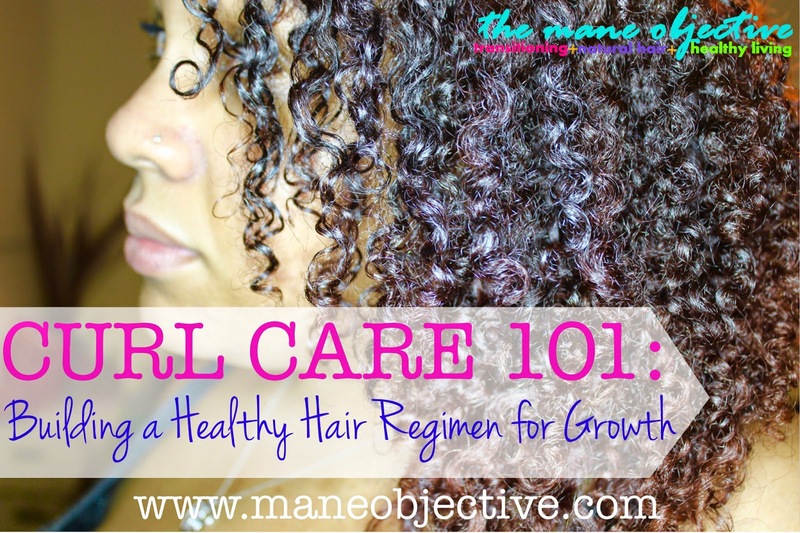 While subsequent weeks of this series will focus in on particular aspects of your regimen with all the juicy details (like deep conditioning or moisturizing), today's topic is all about that overall idea of what a healthy hair regimen entails, and how to build one for yourself that works. A regulated course, as of diet, exercise, or manner of living, intended to preserve or restore health or to attain some result. The dictionary is a beautiful thing, ain't it? a regulated course - this ain't no one-shot deal or overnight sensation. It requires a focused path and consistency. preserve or restore health - you've joined Curl Care 101 for this reason, yeah? attain some result - I think it's safe to say we all want longer, thicker, healthier hair. Unfortunately, some product and vitamin brands want you to think the solution to all of your natural hair woes can be found in their bottle or jar. Let this product junkie be the first to tell you that is a lie (in my Maury voice). No one product or pill can single-handedly turn your natural hair journey around. Can it improve things? Yes, but without comprehensive care, your efforts are in vain and your money goes down the drain. A pre-poo mix of penetrating oils, conditioner, or both: The penetrating oils (like coconut) and conditioners penetrate the surface of the hair, moisturizing internally and prepare the hair for cleansing by improving elasticity, softness, and malleability. Pre-pooing with oils like coconut also ensure that less protein is lost in the wash process, which leads to less cuticle damage and breakage in the long-run. A gentle, yet effective cleanser: One of the problems with shampoos is that many of them with harsh detergents can rob the hair of moisture. One too many uses with the wrong shampoo, and you'll notice your hair drying out and deteriorating over time. Between cowashing and shampooing, I don't advocate one over the other -- I believe they both have a place in any healthy hair regimen. I find that my hair is at its healthiest when I co-wash for 3 weeks, and use shampoo every 4th week of the month. That way, I get the gentle cleansing and moisture infusing benefits of cowashing (Trader Joe's Tea Tree Tingle and Tresemme Naturals Nourishing Moisture Conditioner are my favorites for this) all month long, and move into the next month with a clean slate. Shampooing is vital to preventing buildup, and maintaining scalp health. Just make sure your shampoo is sulfate-free and contains a blend of natural oils and butters to help keep the hair soft and moisturized. My two favorite shampoos are TGIN Moisture Rich Sulfate Free Shampoo and Ouidad Superfruit Renewal Clarifying Cream Shampoo. A quality deep conditioner: Moisturizing, strengthening, or both? I personally prefer to get my moisture-protein balance on the regular, and you should too (unless your hair is protein sensitive...God bless you). A great deep conditioner will have a seamless water-based blend with fatty alcohols to soften the hair, slip agents, humectants, oils/butters, protein, and vitamins that work cohesively to penetrate, soften, add shine, strengthen, improve elasticity, patch up damage, add moisture, and lay the cuticle layer smooth. If your deep conditioner cannot perform all of the above, it's time for a new deep conditioner. Here's a few I recommend. A leave-in: For the love of Jesus, please don't skip your leave-in. Whether it's re-applying some co-wash conditioner or using a specifically-formulated leave-in, just make sure it gets done because leave-ins are the cornerstone to long-term moisture retention. Depending upon your styling goal and hair type, your leave-in can range from a watery spray to a thick, lotion-like conditioner. Click here to see my favorite leave-ins! A moisturizer and sealant: There are different ways to use moisturizers and sealants beyond the LOC and LCO methods, depending on your styling goals, hair type, and leave-in used. Some leave-ins are more moisturizing than others, and you can get away with going straight to sealing and styling, and use a moisturizer in the coming days. Other leave-ins require a moisturizing, water-based cream and then a sealant (LCO). I personally do not advocate the LOC method (although if it works for you, then keep doing it by all means), because it doesn't make sense to me. I can't see the sense in applying a water-based cream to hair that you've already added an occlusive (oil or butter) on. It seems to me that you'd apply everything with water in it first, then lock it all in with an oil or butter. But maybe that's just me. Click here for my favorite moisturizers! thoroughly coat the hair in something with tons of slip -- water and conditioner, water and oil, oil, flaxseed gel, something. work in small sections, combing hair with gentleness and patience from end to root. Don't yank any tools through your hair at all....like, ever. turn on Netflix. You'll need at least 2 or 3 episodes of something to keep you entertained, because detangling is tedious. I highly recommend Orange is the New Black, The Blacklist, House of Cards, Scandal, and of course, re-runs of American Dad or Family Guy. You can also feel free to detangle your hair in the shower with a slippy conditioner (Trader Joe's Tea Tree Tingle is THE TRUTH for this) in sections as well. That's what I do -- while listening to my jams on Spotify. While we're on the topic of gentle hair handling, let's talk styling really quickly. Whatever style you choose to do -- twist-outs, braid-outs, buns, updos, ponytails, frohawks -- do them with patience, care, and attention. Securing any sort of styling tool to your hair too tightly is a recipe for headaches, breakage, scalp soreness, and sometimes hair loss. Yes girl, that puff is fly -- but if it makes you look surprised all day, then don't be surprised when #themedges are gone. Just be mindful and style gently. You should have a nighttime routine for your hair that involves more than just laying down and going to sleep. Do you have to re-twist your hair nightly, or set it on fifty-leven perm rods before bed? No (and I wouldn't recommend that much manipulation anyways). Make sure you invest in a satin pillowcase and scarf or bonnet. They prevent the friction and moisture-robbing cotton pillowcases from plaguing you in the nighttime. Before you throw either scarf or bonnet on, feel your hair. Does it feel dry, or is it still moisturized? Being out in dry or cold air can take a toll on the hair, and it is important to restore moisture to your hair at nighttime. If needed, apply water-based moisture (in the form of a spray or butter cream) and a sealant to your hair with a light hand. We will touch more on what that looks like later. Now that you've got a pretty good handle on what makes a good regimen, let's get to what you all came here for: an infographic. Be sure to pin it, love on it, print it out, share it on social media, and of course -- tag me in it! Note: This regimen is just an example, and the products shown are examples as well (although of course, I use them all -- except that pesky avocado and banana lol). You can take the essence and principles of the regimen and tweak them to your liking (or frequency), or just adopt it out right. Either way, let me know how it goes and I hope you found this helpful! Infographics are time consuming, and I wanted to get this one just right for you all. 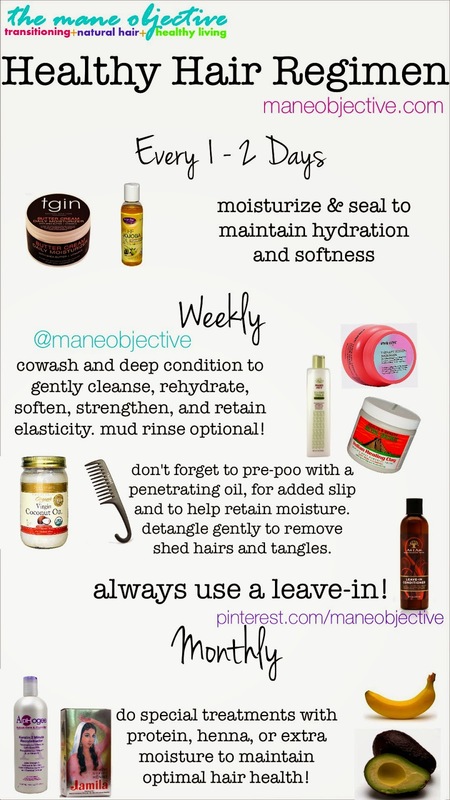 Stay tuned for next week -- we're going to get more in-depth with pre-pooing and detangling! My hair sheds like crazy is it anything you recommend? You might also be interested in MSM (the supplement), as it has been shown to lengthen the growth cycle of the hair (reducing shedding). Check with your doctor prior to starting any supplement regimen, because some supplements do interfere with prescribed medications. Good luck! It started when I was transitioning which I expected. I transitioned for 18 months finally cut the last relaxed ends January 2014 and it's been shedding ever since. I thought that after I cut all of the relaxer off it would stop shedding. Now I will say that it doesn't shed as much as it did in the beginning but it seems to still shed more than I would like. I've went to a stylist she said it was normal I've been to the doctor and they said it's no underlining issue so I'm going to take your advice and try the products thanks for replying. At least I know I'm on the right track with my regimen.... very helpful! Awesome and fascinating written work! A debt of gratitude is in order for the tips! don't hesitate to send me your next blog entry. What you are expounding on is well done. A debt of gratitude is in order for the read i additionally do hair professionally and full time and will share your webpage on my site when its posted on the off chance that you might want to network reach me and we can trade thoughts on hair and hair items. Today, it is just about the effective ways to deal with your hair issues when highly damaged but one should never think of using until and unless they can protect their hairs. The letter of intent pharmacy residency is quite perfect deal and combination for the people who care a lot for their health. Good way to help the peoples hair loss is biggest problem in all over the world i advised you to visit our site and get more important info about hair loss problem. Thanks for site because this site very informative for all women in the world.An excellent solution which can be found for anyone who is suffering from the damaged scalp and hair issues is the silk base lace closure. Very helpful integration of information beneficial to get healthy hair in natural way. .If you want healthy and shiny hair then you need daily care for that. Using expensive cosmetics only can not better treat you hair. It is very important that it is included in you daily hair care routine. Today Hair loss is one of the most common problems faced by millions of people all over the world. As we see that a large number of peoples has the problem with their hairs problems like whiteness, blandness and weak hairs. It's a reality that there is no remedy for hair reduction. So if you're building a hairless spot or your hair is loss a bit, nothing short a hair implant can deliver a long lasting solution.The excellent news is that there are various types of products and solutions that can immediately hide hair loss, and cover up balding. Health and beauty starts with beautiful hair. Thanks for sharing this tutorials to building our healthy hair. The personal statement pharmacy school is quite interesting to know when you the letter becomes important to write. Thank you very much for sharing this nice information. I like your blog. Wow.. Its look stunning. hair transplant is a method and a best surgery to regain lost hairs naturally. In India AVENUES COSMETIC is best clinic for hair transplant in affordable prices. Great tips thanks for sharing this valuable article.. Hair regrowth is a challenging target for people. Considering the falling quality of diet, pollution falling hair, baldness or thin hair have become a huge problem for all. While taking a healthy diet is desirable, applying other natural remedies like olive oil or castor oil also helps. The article has a lot of interesting information.